This name uses Portuguese naming customs. The first or maternal family name is Miranda and the second or paternal family name is de Souza. Born in Paranavaí, Paraná, Miranda started at Coritiba, where he made 89 appearances and scored 6 goals. On 29 July 2005, Miranda signed a four-year deal with French side Sochaux. Miranda made twenty appearances for Sochaux as the club finished mid-table but he was not able to settle in France and soon moved back to his home country. Miranda returned to Brazil in August 2006, on loan to São Paulo FC. In March 2007, he signed with São Paulo FC until 2011. In the same year, São Paulo won the 2006 Campeonato Brasileiro. He went on to win the 2007 and the 2008 editions of the Campeonato Brasileiro also, even being selected for the "Team of the Year" in both 2007 and 2008 respectively. While São Paulo failed to win any more national titles during Miranda's stay with the club, his individual performances did not go unheralded, as he was included in a further two "Team of the Year" squads in 2009 and 2010. Miranda joined Spanish side Atlético Madrid on July 2011 upon signing a three-year pre-contractual agreement in January 2011 with Atlético after deciding not to renew his contract with São Paulo which was due to expire on July 2011. Miranda made his competitive debut for his new club on 25 August 2011 in a 4–0 thumping of Portuguese side Vitória S.C. in the second leg of their Europa League playoff round tie. Miranda made his La Liga debut on 10 September in a 1–0 loss to Valencia CF, Roberto Soldado scoring the game's only goal. The Brazilian defender scored his first goal for the capital club against Granada CF on 11 March 2012, converting a pass from Diego Godín to a goal in the top left corner of the net, pushing the club to a 2–0 league victory. On 8 April, Miranda put in an underwhelming display against fellow Champions League chasing club Levante UD, letting Arouna Koné in for Levante's second goal in the tenth minute and then picking up a red card with seven minutes left; Atlético lost the game 2–0 and Levante moved up to fourth place. His first European goal for the club came later that month against Spanish opposition, scoring Atlético's second goal in an eventual 4–2 first-leg win against Valencia in the semi-finals of their Europa League encounter on 19 April. Miranda scored Atlético's third goal in their 4–1 UEFA Super Cup thrashing of European Champions Chelsea on 31 August 2012. On 12 March 2013, Miranda renewed his contract with Madrid, keeping him in Spain until 2016. In the Copa del Rey final on 17 May, Miranda provided the match-winner, scoring a header in added time of extra time to give Atlético a 2–1 victory over Real Madrid. This ended a streak of 25 games, stretching back to 1999, without a win against their city rivals. After helping Atlético to their first league title in 17 years, Miranda was nominated in 2014 as the best defender in La Liga, alongside teammate Filipe Luís and Real Madrid's Sergio Ramos. On 30 June 2015, Serie A club Inter Milan announced that they had signed Miranda on a two-year loan, for €4 million, with an obligation to sign outright for an additional €11 million on 1 July 2017, with conditions that would push the date even earlier. The obligation was activated after Miranda's 2016–17 season debut for Inter on 20 July. Miranda made his Inter debut on 23 August as they began the season with a 1–0 home win over Atalanta. He played 32 games over the campaign, scoring once in a 3–1 victory against Sampdoria at the San Siro on 20 February 2016. He was also sent off twice in his first year with the Nerazzurri, the first coming on 27 September 2015 for a foul on Nikola Kalinić in a 4–1 home loss to Fiorentina that ended Inter's unbeaten start. On 20 August 2007, Miranda received his first call-up to the national team, along with Thiago Silva, as a replacement for Lúcio and Luisão in a friendly match against Algeria. However, he did not make his debut as he was only an unused substitute during the match. More than a year later, Miranda made his first international appearance for Brazil in a 2010 FIFA World Cup qualification match against Peru on 1 April 2009. He came on as a substitute for Luisão who was injured during the game. Miranda was part of the Brazil squad which won the 2009 FIFA Confederations Cup in South Africa. He replaced Kléber at left-back for the second group game against the United States in Pretoria, but he saw himself replaced in the third match by André Santos, who remained in the position for the rest of the tournament. 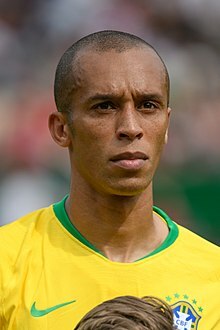 In January 2013, Miranda was called up for Brazil for the first time since 2009 ahead of a friendly against England; it was the first squad for Luiz Felipe Scolari's return as manager. He was one of seven players put on standby for Brazil's 2014 FIFA World Cup team. Under new coach Dunga, Miranda became a regular starter in the Brazilian defence, replacing former captain Thiago Silva as David Luiz's central defensive partner. In May 2015, he was included in Brazil's 23-man squad for the 2015 Copa América held in Chile. On 21 June, he replaced the suspended Neymar as captain of the Seleção in a 2–1 win against Venezuela. In May 2016, Miranda was named as Brazil's captain for the Copa América Centenario in the United States, a group stage exit. Miranda scored his first international goal on 6 September 2016, in the second minute of a 2–1 win over Colombia in Manaus in 2018 FIFA World Cup qualification. Manager Tite named him in the final 23-man squad for the finals in Russia. ^ "Sochaux contrata zagueiro brasileiro João Miranda" (in Portuguese). UOL Esporte. 29 July 2005. Retrieved 12 March 2013. ^ "São Paulo contrata zagueiro Miranda, 'herdeiro' de Lugano" (in Portuguese). UOL Esporte. 28 August 2006. Retrieved 12 March 2013. ^ "São Paulo domina premiação da CBF" (in Portuguese). Globo Esporte. 3 December 2007. ^ "Hexacampeão, São Paulo domina também o Prêmio Craque Brasileirão" (in Portuguese). Globo Esporte. 8 December 2008. ^ "Miranda fecha com Atlético de Madr" (in Portuguese). Globoesporte.com. 7 January 2011. Retrieved 12 March 2013. ^ "Vitória SC 0–4 Atlético". UEFA. 25 August 2011. ^ "Valencia CF 1 – 0 Atlético Madrid". Yahoo! Sports. 10 September 2011. ^ "Atletico Madrid 2–0 Granada". ESPNFC. 11 March 2012. Archived from the original on 1 September 2013. ^ "Atlético in control against rivals Valencia". UEFA. 19 April 2012. ^ "Chelsea were comprehensively beaten in the Super Cup as Radamel Falcao scored a hat-trick to inspire Atletico Madrid to victory in Monaco". BBC Sport. 31 August 2012. ^ "Miranda extends Atlético deal until 2016". Marca. 12 March 2013. Retrieved 12 March 2013. ^ "Jose Mourinho and Cristiano Ronaldo off in Real Madrid loss". BBC Sport. 17 May 2013. ^ "Atletico party like it's 1999". ESPNFC. 17 May 2013. ^ Fernandez-Abascal, Eduardo (14 October 2014). "Chelsea Duo Thibaut Courtois And Filipe Luis Nominated For La Liga Awards". International Business Times. Retrieved 15 October 2014. ^ "Inter agree €15 million deal for Miranda". goal.com. Retrieved 30 June 2015. ^ a b "Inter confirm Miranda move". goal.com. Retrieved 30 June 2015. ^ "IMIRANDA FLIES IN FOR MEDICAL". Inter.it. Retrieved 30 June 2015. ^ a b page 8 of Relazione sulla gestione (Management Report) F.C. Internazionale Milano S.p.A. bilancio (financial report and accounts) on 30 June 2015 (in Italian), PDF purchased from Italian C.C.I.A.A. ^ page 2 of Relazione sulla gestione (Management Report) "2015–16 Bilancio" [2015–16 Annual Report] (page contains code and password to download the actual PDF from http://www.registroimprese.it). Inter Milan (in Italian). CCIAA. 21 December 2016 [October 2016]. Retrieved 21 December 2016. ^ "Mancine sorride sotto gli occhi di Mourinho" [Mancini smiles under the eyes of Mourinho]. La Repubblica (in Italian). 20 February 2016. Retrieved 17 June 2018. ^ "Inter Milan 1–4 Fiorentina". BBC Sport. 27 September 2015. Retrieved 17 June 2018. ^ Sánchez, Alberto (22 January 2013). "Miranda y Filipe Luis estarán en la próxima convocatoria de Brasil" [Miranda and Filipe Luis will be in Brazil's next squad] (in Spanish). Vavel. Retrieved 17 June 2018. ^ "World Cup 2014: Kaka and Robinho omitted from Brazil squad". BBC Sport. 13 May 2014. Retrieved 14 May 2014. ^ "Dunga indica zaga com Miranda e David Luiz; Thiago Silva será reserva". Rede Globo. 3 June 2015. ^ "Brazil v Venezuela: 2-1 win sees Dunga side progress in Copa America despite Neymar absence". Fox Sports. 22 June 2015. ^ "Inter Milan's Copa America players: Miranda, Murillo, Banega, Medel". ESPN. 29 June 2016. ^ Mansur, Carlos Eduardo (6 September 2016). "Brasil derrota a Colômbia com gols de Miranda e Neymar em Manaus" [Brazil defeat Colombia with goals from Miranda and Neymar in Manaus] (in Portuguese). Retrieved 17 June 2018. ^ "Brazil – João Miranda – Profile with news, career statistics and history". Soccerway. 21 February 2016. Retrieved 21 February 2016. ^ "Football : João Miranda". Football DataBase. 21 February 2016. Retrieved 21 February 2016. ^ "João Miranda". National Football Teams. Benjamin Strack-Zimmerman. Retrieved 21 February 2016. ^ "Atletico Madrid win La Liga". Sport 24. 17 May 2014. Retrieved 29 January 2015. ^ "Real Madrid – At. Madrid" (in Spanish). RFEF. 17 May 2013. Retrieved 29 January 2015. ^ "Barcelona 0–0 Atletico Madrid: Catalans win Spanish Super Cup". BBC Sport. 29 August 2013. Retrieved 29 January 2015. ^ "Falcao at double as Atlético march to title". UEFA. 9 May 2012. Retrieved 29 January 2015. ^ "Chelsea 1–4 Atletico Madrid". BBC Sport. 1 September 2012. Retrieved 29 January 2015. ^ "Madrid finally fulfil Décima dream". UEFA. 24 May 2014. Retrieved 29 January 2015. ^ "São Paulo domina premiação da CBF" (in Portuguese). Globo Esporte. 3 December 2007. Retrieved 21 June 2009. ^ "Hexacampeão, São Paulo domina também o Prêmio Craque Brasileirão" (in Portuguese). Globo Esporte. 8 December 2008. Retrieved 21 June 2009. ^ "Hexacampeão, Flamengo recebe troféu de campeão nacional" (in Portuguese). Globo Esporte. 8 December 2009. Retrieved 9 December 2009. ^ "Prêmio Craque do Brasileirão" (in Portuguese). Globo Esporte. 6 December 2010. Retrieved 19 May 2009. Wikimedia Commons has media related to João Miranda. This page was last edited on 12 April 2019, at 22:30 (UTC).